It's been a while since heroes from King of Fighters have been added to Returners and many players got the chance to explore their gameplay efficiency and strategies. 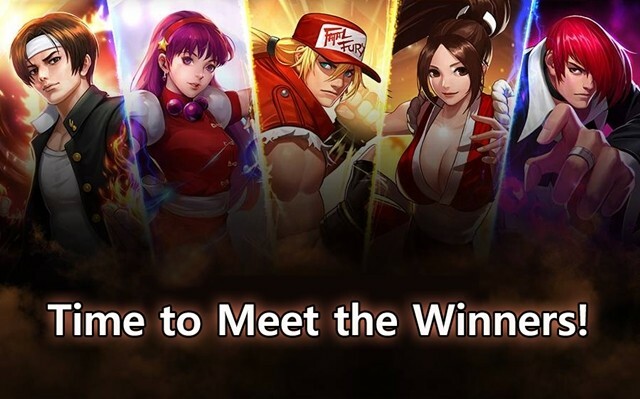 We, Inven Global, held an event where you could share your own info and tips about KoF heroes with others. Many of you shared your amazing tips in the comment section for 2 weeks, and they have immensely helped others who have yet to find out more about these heroes. In case you don’t know what hero you should use or what gear set you should go for, go ahead and read these helpful tips in the comment section! Now, it’s time to announce our winners! First of all, all participants will be getting 500 Bluestones! Then, our lucky winners who were randomly selected will either get a 5-Star Legendary Gear Selection or additional 3,000 Bluestones. The winners are listed below, and once again, thank you all for your participation! The rewards will be sent to your inbox by October 15th (PDT)! Nice! First time winning a raffle event! Thanks Inven! Congratulations to the other winners as well! Congrats to every1 who won. RETURNERS Team - pls keep up the good work. This game has so much room to grow! By the way, my name is the result of the name, my children gave me ???? I believe that thread was totally a sucess for everyone who needs an advice or a tip for these kof characters and can also be handy for other similiar heroes.